An exhaustive guide to introduce beginner students to the various phrases or “riffs” that make up Blues sax playing, both from a rhythmic and soloing standpoint. There are five sections to the riffs in the book, section 1 contains basic Blues riffs, section 2 contains Rhythm & Blues influenced riffs, section 3 contains Blues/Boogie Woogie riffs, section 4 contains Rock influenced Blues riffs and section 5 contains Gospel influenced Blues riffs. 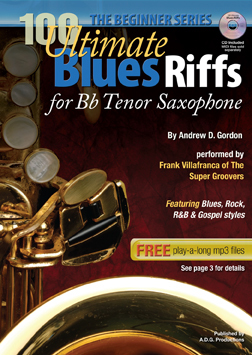 Included with this book is an audio CD that contains all the riffs, recorded twice: first, sax melody, piano, guitar, bass and drums and second just the rhythm track of piano, guitar bass & drums so you can play-a-long.